It’s amazingly easy to put off changing your life. It can feel like we have to wait to find the ‘right’ seminar or read the ‘right’ book or search out the ‘right’ guru. But there are 3 simple things you could do today, to make shifts in your life. And they all take less than 5 minutes. Just because these actions don’t take as long as a 10-day retreat – and just because they sound simple – don’t be fooled into thinking they won’t work. Pick one of these to do each day and your life will shift, as surely as the sun rises and sets, in a matter of a few short weeks. The only thing you need to do is to remember to do them – and that can’t be so hard, can it? The situations we encounter in life aren’t what causes us pain and anguish – it’s the stories we tell ourselves about them that do the damage. Most of us are addicted to telling ourselves stories – usually with the drama of a soap opera. The more we crank up the drama, the more we indulge in these stories, the more the drama and stories feel ‘real’. How can you break this habit? Let the answer gently bubble up. And if you catch yourself going back through the ‘but… ‘ cycle, ask yourself the question again. The more honest you can be with yourself, the more quickly you will set yourself free from the painful old story habit. And the funny thing is, as soon as we let go of our old addiction to telling stories – even just for 5 minutes – it’s amazing how quickly we feel better. Breathe – properly – stop pretending to breathe! Time to stop and breathe? Most of us are just pretending to breathe – breathing just enough to stay ‘alive’, but not breathing deeply enough to be ‘living’. Shallow upper-chest breathing is a common symptom of stress and poor posture. It’s nothing more (usually) than a bad habit. But its impacts are many – poor blood oxygenation can lead to tiredness, grumpiness, fuzzy thinking and physical disease. Here’s how to do three minutes of belly breathing. Look around you next time you’re out and about in a busy street. When you get older, which kind of face would you rather have? The one that is furrowed with worry lines and frown grooves? Or the one with crow’s feet and laughter lines? Our ‘relaxed state’ facial expression is a scarily public indicator of our inner emotional state. Happy people have happy faces. Sad people have sad faces. Grumpy people have grumpy faces. And we can choose which face we wear. I’m inviting you to try an experiment with me today, to experience the difference your facial expression can make. It only takes a few minutes – and it might just change your life. Which face will you choose? Why it could be the most important decision you make today. I hope you enjoy playing with these 3 things you could do in under five minutes to change your life today. I’d love to hear how you get on. How about sharing your experiences and questions, via the comments box? Ready to take things to the next level? 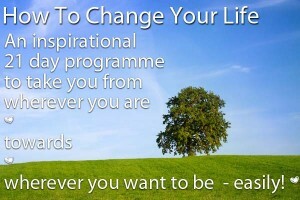 How about joining in with our 21 day online course: How To Change Your Life? Not ready for a course yet? How about joining in with the discussions over at our Soul-Sized Living Forum? Sign up today – it’s free and you’ll get your hands on lots of members-only goodies!